15 minutes after having left the highway A 8 you will be at our villa "Arthur", Welcomed in a beautiful garden of some 1500m2 and the large pool. Garden is completely fenced, and situated on a hillside facing south. You are in a rural area, between Le Thoronet and Lorgues. In 5 minuten met de auto zal je in de midden van alle activiteit. Le Thoronet offers you a few restaurants, supermarket, bakery, butcher etc. But for more options choose Lorgues 5 km away, a village with plenty of activities, restaurants, bars, supermarkets and weekly famous markets. Når du kommer ind i fronten, skal du straks mærke lys og farver, klassiske møbler og Provence dekoration. Du vil straks føle deg hjemme. Ground floor offers you 1 bedroom, bathroom and separate toilet, living and dining room, TV, fireplace, wifi, computer, movies, music, books. Separate kitchen with all utensils. Access to the garden from living room, dining room, kitchen and the bedroom. A large west and south oriented terrace partly covered, offers you hours of relaxation. The first floor offers you 2 bedrooms, shower and toilet in one. Our house is a living house, which means it is never closed down. Det er stadigt at være kontrolleret og vedligeholdt, og du vil finde mange nyttige produkter, der gør hele din ferie meget lettere. You save precious time. BBQ and Table tennis in the garden, vtt bikes can be rented, pool can be heated. Bed linen and towels for rent. Baby sitting possible. Visit Italy, Monaco, Menton, Nice, Antibes, Cannes, St. Tropez or Aix, from 30 minutes to 70 minutes you will reach these places. Back country is full of adventure, climbing, boat, gliding, golf, tennis, wine tasting, cultural activities, you name it ... Never get tired of our region. Nogle uger af året er huset blevet tilbudt til en meget reduceret pris, for kun 3 personer. You dispose of all the main rooms, and 2 bedrooms and one bathroom. Garden and pool is all yours. Séjour conforme à ce que nous souhaitions : du calme et de la tranquillité ! 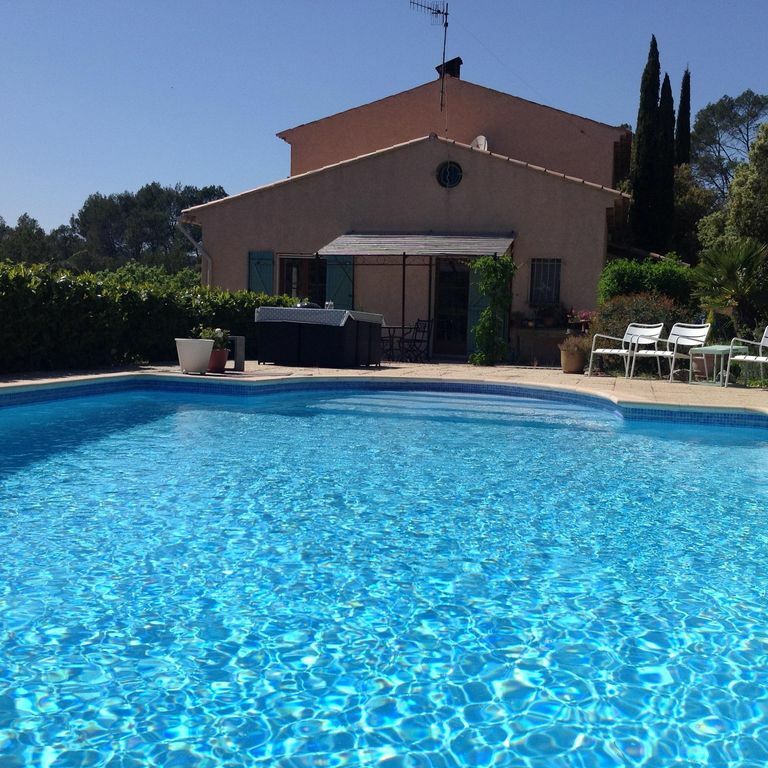 The villa is located in perfect distance to Le Thoronet 3 minutes, and Lorgues 5 minutes in car. No matter what way you choose, you will easily get to the beach into the back country Gorges de Verdon, all the wine castles etc.